This is one of my most used shop made tools. It's for use with spiral point quality taps for power tapping with a battery drill. On the same subject this is probably my least used tool. But, when you need it nothing else will do. And, for those that aren't familiar with spiral taps, here are the two types. Spiral point are for through holes while spiral flute are for blind holes. Here's a real simple little do-dad I was just using yesterday. For a sense of scale, that screw is 6-32. This is used for pulling needles off of dial indicators and dial calipers when they need repair (or just to confound you're associates ). 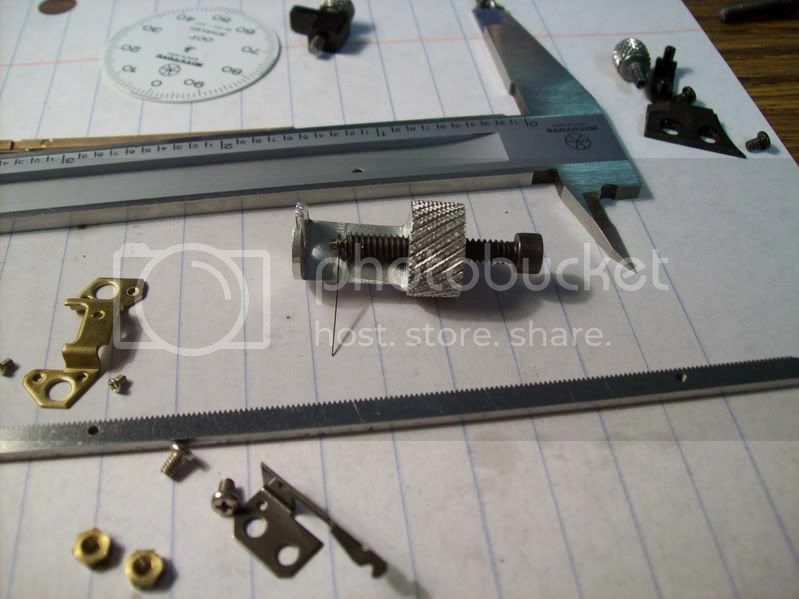 I made this two years ago or so to repair my dial calipers. 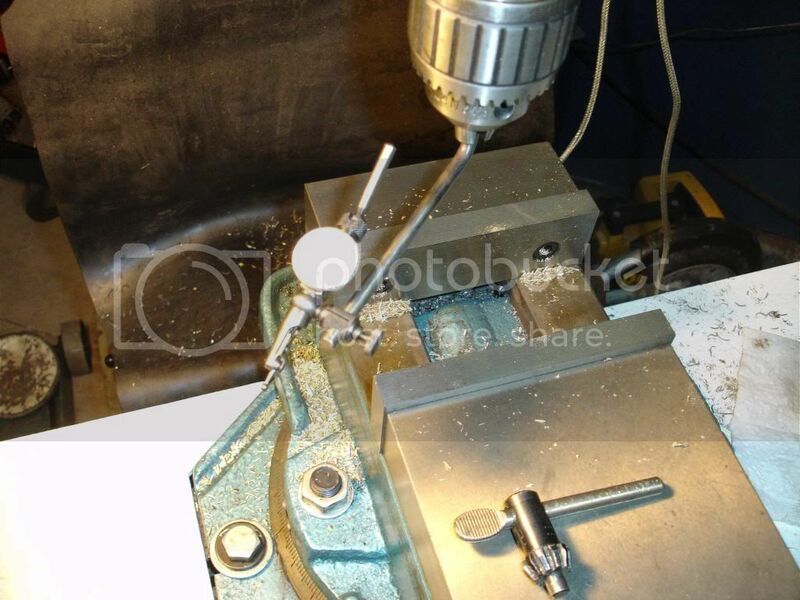 Do you rotate the spindle 180 degrees and look at the indicators from the backside to check for runout in the collet? 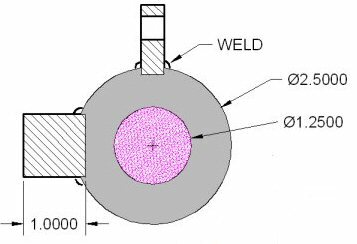 Below is a simple attachment that I made to tram mill heads. A piece of 3/16 drill rod heated and bent at 90 degree. I always tram the x axis first to get things close and then bring the indicator towards me and bring the head in so it matches the x axis. Then double check the x axis again. Then the Y axis front and back. Might take me 5 minutes to bring both axis into within .001 inch sweeping 10 to 12 inches. Simple but it works for me. Using one of those Cree LED lights that Evan told us about. 4 AA batteries on a Mighty Mag base and some Loc-Line. Super bright light for poor old eyeballs that don't like to focus. Made this a couple of years ago. It's an air tapper, I bought the head and collet set, red box on left, and made the frame. The tapping head and collets cost me £320 UKP so that makes a pressed steel frame quite expensive. 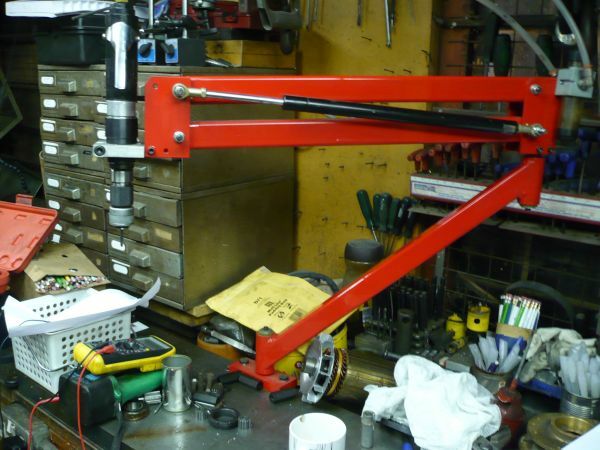 I had some old adjustable gas struts of some old inkmixers and I though I'd fit one and adjust it the get neutral balance, an inkmixer is far heavier. Made all the fittings and got the adjusting allen key when I came to fit it only to find no adjustment screw hole and all the markings were in Chinese ! 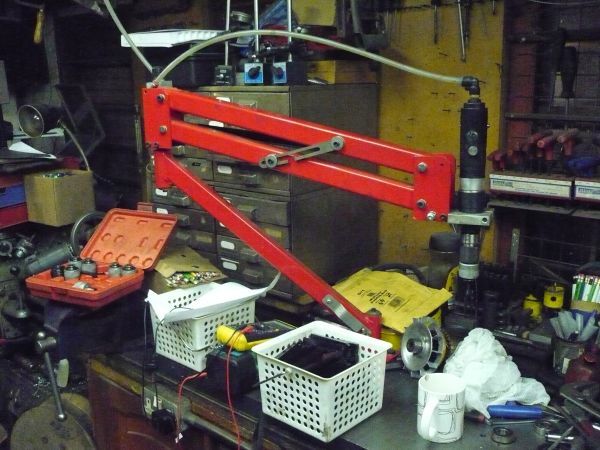 I had picked the gas strut up of an X3 that had been converted to CNC but ironically although it was a fixed rating it was perfect for the job. It's a dream powering a M4 tap into a blind hole in alloy, waiting for it to slip then reverse out, so quick and no more broken taps and all the holes are square. I should have built one / bought one years ago. To save time a lot of people have centre drills mounted in a blank arbor to save having to keep swapping drills. Next step is to swap to a drill chuck and drill. However not the tailstock ram travel in the first picture, in extreme cases you can even run out of travel using these MT blanks for this application. Note the new centre drill holder is made to match the length of a drill chuck or a tad above to allow for a drill. 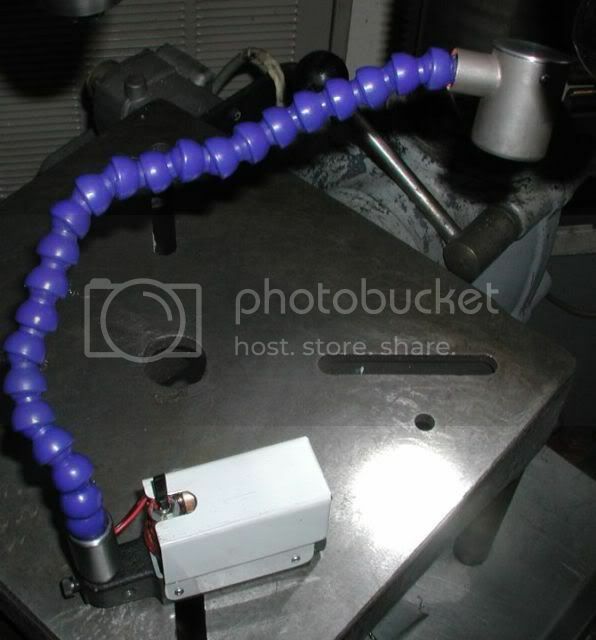 This saves all the winding in and out given holders of different lengths. 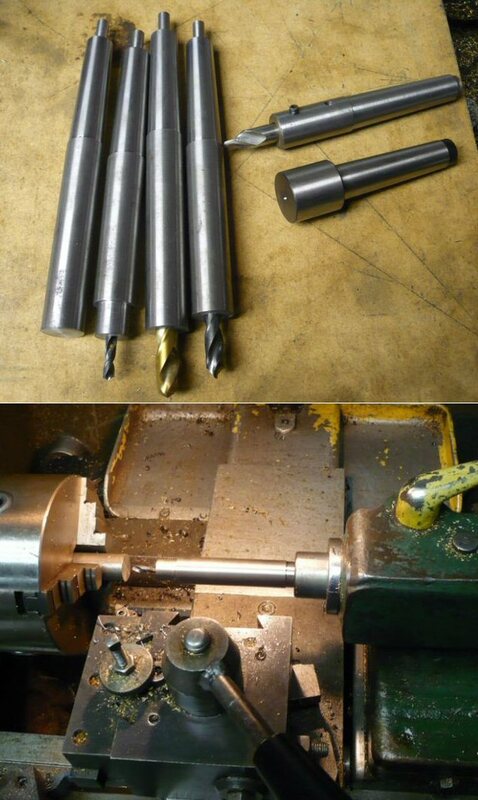 It only remains then to make a series of holder to haod centre drills and common tapping size drills. Standard blank arbor on right with early centre drill holder above. New arbors on left, the turned pip on the end is the mimic a tang for the extraction rod to work on the end. These save valuable minutes over the length of a job. Making dedicated arbours for oft-used drills makes a lot of sense. But, unless you have a lever operated tailstock, you still need to wind the tailstock barrel back a long way to eject the arbour and have enough clearance to get the arbour out of the tailstock taper. 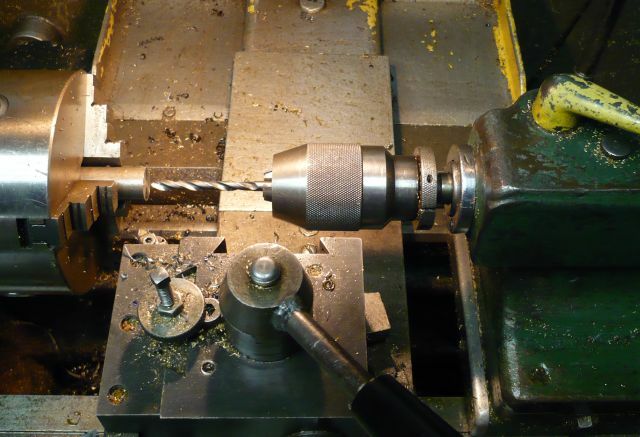 The drills that you show are all small, and won't put a lot of torque on the morse taper section of the taper. 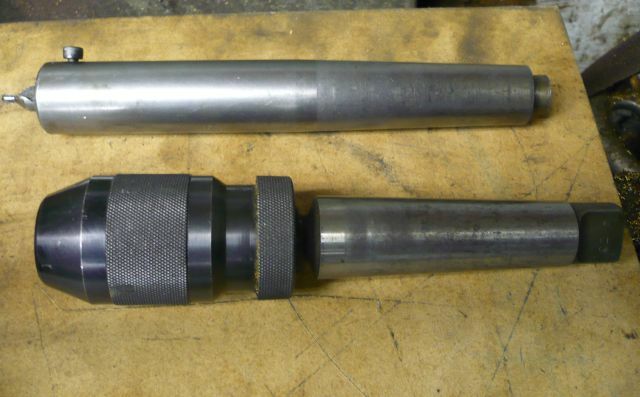 To save winding the barrel back & forth, how about halving the length of the Morse taper section of the arbours (just keep the large end of the taper, saw the smaller half off). It should leave enough length to centre, align and drive the arbour - it'll still be longer than the average ER collet. This'll let you remove the arbour with less retraction of the barrel. Snag is, of course, it then won't self eject. 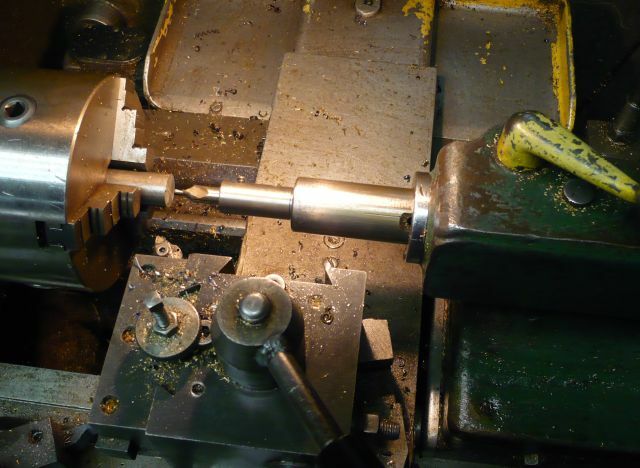 Get around this by machining a ring into the arbour just in front of the front face of the barrel. Make a fork with 2 pins that slips into the ring and lever against the front face of the barrel to pop the arbour out. Why not thread the outer end of the morse holder and fit ejector ring - make it really quick to eject. I have tools I don't know how to use!! Even though it's well greased and the outside is knurled, it takes a surprising effort to jack the centre out using it - I still need to get a C spanner on it. 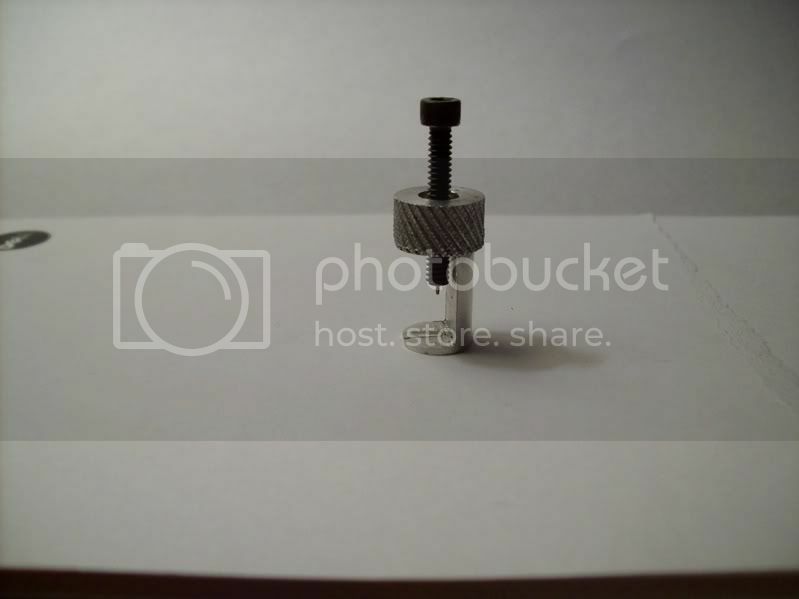 I thought a machined ring might be quicker to make and use, and you'll need some kind of spanner anyway. No you are missing the point, its so you don't HAVE to wind right out. Look at the first pic and the last pic. The extended one will release within 1" the first one, like most people make need to rewind 3" to release.